Is he also Bacchus, in Roman? Wasn't Dionysus always portrayed as being on the chunky side? Hey NeOlympus finally got a drunk uncle. Too bad he doesn't have any nephews and nieces to be an uncle. I wonder what his father thinks of him. 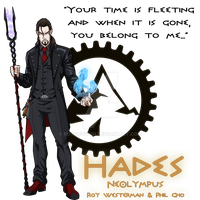 Hades is proud of him, almost unwaveringly so. He sees a lot of his mother in him and though he wishes Dionysus would be more serious (like Zagreus was), Hades blames himself for that as he couldn't save his son from that pain and couldn't bring himself to give his only child the peace of death. Yup, that's a party animal right there. A party animal or THE party animal? Should have a panther/leopard motif somewhere to make the connection complete. Sorry, I am a harbinjer of Ancient greek sacred stories. Looks great! I do have mention that he has a panther skin laid over his throne's seat in Olympus in the story... but yeah, maybe we could've given him a leopard patch on his pants or something. I am glad you like it. 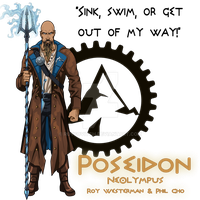 I'd be interested to hear what you think of his and the other gods' profiles in my NeOlympus folder. Yes, I just looked at them. I am not much of the steam-theme fan, so while the art in general is outstanding, its hard for me to fully enjoy them. But all around they look great. I guess when it comes to ancient sacred stories, I am a traditionalist. Heheh. But again you art is greart. Thanks, bro! *hiccup* I'll take that as a condiment *hiccup, sniffle* I meant compliment! Where the heck did he get a Hawaiian shirt in Steampunk times! Steampunk times? When exactly were steampunk times? You do know that's not a real historical time, right? What is a Hawaiian shirt but a button-up shirt with bright colors with a floral pattern (usually)? Totally within the realm of possibility for them to produced by Elysian textile shops. Also, if you don't buy that, I've established that temporally-speaking NeOlympus takes place in modern times, they just live on a world that's a bit behind the times & Hermes still visits Earth. As Hermes is like the ultimate tourist, he's probably the sort to buy Aloha Shirts in bulk. Not a stretch that he'd give some to Dionysus. Hawaiian shirts are one of those things I put in all of my works in one way or another (that, heterochromia, and others). I had to find a way to work it in. I've lost your respect, I see. Well, if I figure out where I put it, I'll be sure to give it back. Your ellipses are killing me. And to answer your original question, he is the God of intoxicants, festivals, vineyards, alcohol, and theatre. He is also the creator of wine according to Greek mythology. So yeah... he was like the original frat boy. Well, among the epithets he has, we have "Divine Celebrant", "The Drunk God", "The Great Intoxicated One", and more. I don't think "Steampunk Fratboy" is inaccurate. And he loves you! So, who should be the next divine installment in NeOlympus? Dionysus' mommy? Yep. High time he had a little bit of happiness! He looks so great! Drunk job, Phil!